Strengthen and tone abs, shoulder, waist, arms and back • Strong ABS bracket, thickened and durable • maximum bear 200kg. Dismountable handle• Specialist soft foam grip •TPE wheel, silent, anti-slip, wearproof and shock proof • Folding front wheel, saving space, convenient for carrying. Wider rear wheel design • Stable triangle supporting• Comes with a mat to protect your knee. 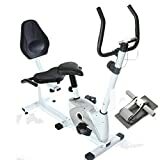 Upright and recumbent riding positions • Magnetic, friction free design • Adjustable levels of tension/resistance • LCD Computer: Time, speed, pulse, distance, calorie and scan. Adjustable recumbent and upright seats • High quality powder coated steel tubing. Assembled dimensions (LxWxH): 109 x 47 x 117cm • Upright seat to floor: 66 – 84cm – Recumbent seat to floor: 50cm.